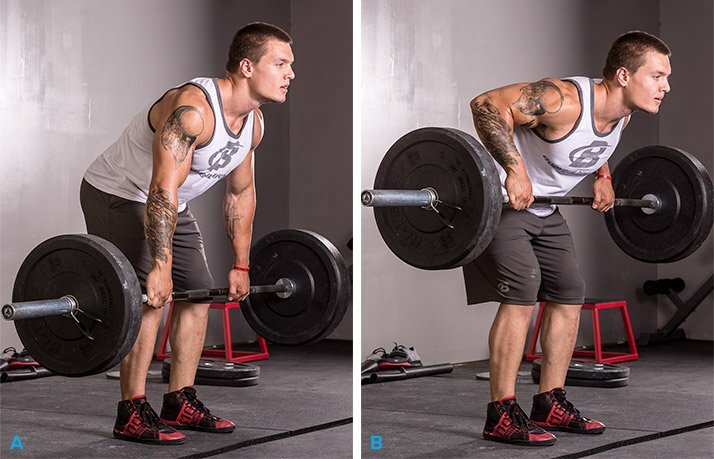 Barbell rows are probably the single-best back builder, but they're easy to get wrong. 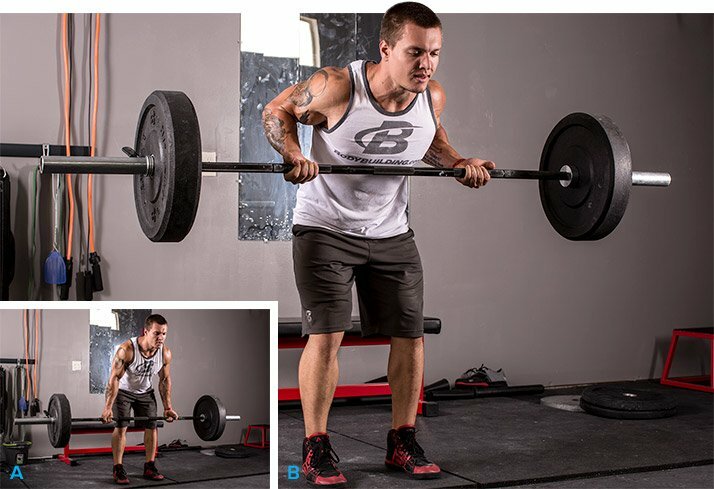 Avoid these 5 common technique errors and row to grow! I can still vividly recall the first time I walked into Metroflex Gym in Arlington, Texas, a decade ago and watched eight-time Mr. Olympia Ronnie Coleman perform perfect bent-over barbell rows with 405 pounds. To this day, I've never seen a back that has come close to duplicating the muscularity of "King" Coleman, and it was clear to me then that barbell rows were a staple in his epic back-building routine. They should be given equal weight in your regimen, as well! 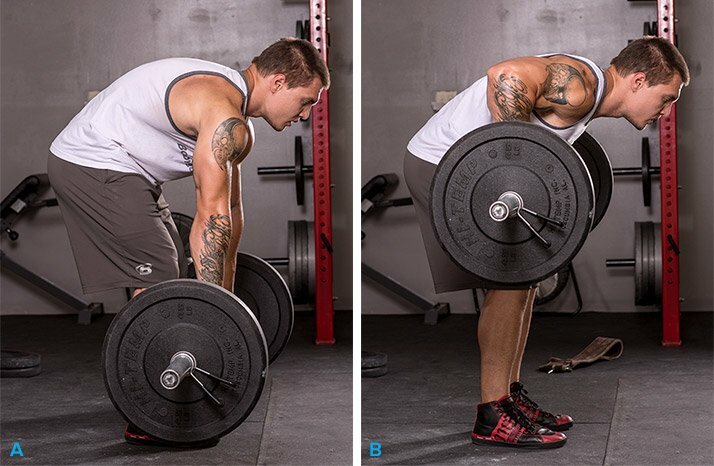 Properly performed bent-over barbell rows have direct transference to all three powerlifts—the bench press, squat, and deadlift. From a hypertrophy standpoint, rows build the lats, rhomboids, and traps. Heck, just look at an upper-back anatomy chart—bent-over rows work all the muscles you see. Not to mentionthat, to some degree, bent-over rows also work the glutes and hamstrings. Bottom line: If your goals consist of size, strength, and symmetry, bent-over rows can play a pivotal role in hitting those goals, assuming you perform them properly. Improperly performed rows, however, fall pretty far on the risk side of the risk-to-benefit ratio. 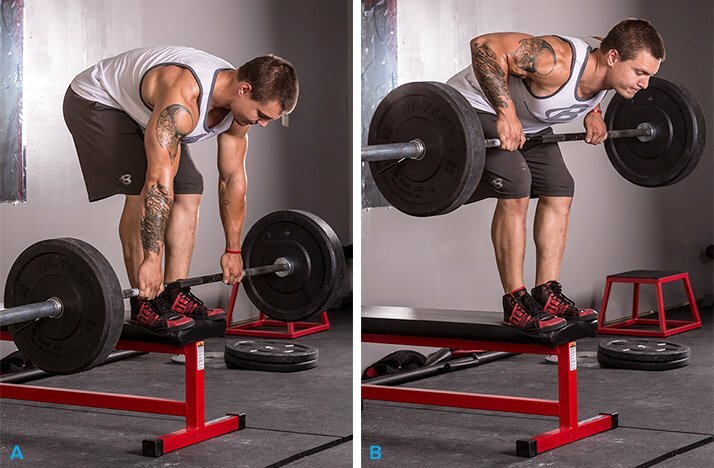 With that in mind, let's take a look at five common technical bent-over row blunders and how best to fix them. After reading this article, you'll be on your way to building a Coleman-sized back in no time! While the row is mainly an upper-body exercise, that doesn't mean knee position is inconsequential to the outcome. Squat down too far and your hips end up too low, making it difficult to maintain your body position for the duration of the move. On the other hand, if you lock out your knees, you put undue stress on the low back while limiting the amount of weight you can use. The proper amount of knee bend is 15-20 degrees; this position doesn't change throughout the entirety of the movement. This blunder almost didn't make the list since I hadn't seen it in a while, but then I traveled to Las Vegas for a seminar I was giving and, sure enough, it's back on. There are a number of reasons I don't recommend this practice, starting with the aforementioned risk-to-benefit ratio. Even if the benefit was greater, there's a huge risk of falling off the bench when you're working with a heavy load. The bottom position for a proper row is with the torso slightly above parallel and your arms extended—and you don't need to go any further. If you choose to descend even more, your lower back will be in a much more vulnerable position and you'll even be mechanically weaker, robbing the intended musculature of its work. Use a full range of motion, not an extended one. You've read about it over and over again on the web, but are you sure you're not guilty of this all-too-common error? To avoid back pain, you need to keep your lower back in a neutral position. Letting it round squeezes your spinal discs, which can have devastating consequences. While overarching can cause its own issues and isn't recommended, failing to hold the arch and letting your lower back round is the more common error. Rounding is unsafe, not to mention extremely inefficient for rowing maximal weights. One cue that can help correct rounding is thinking of lifting your chest up without lifting your entire torso. Don't try to curl the weight—barbell rows aren't curls! Barbell rows are much heavier, and there's no way your biceps can handle the load. If you're getting sore primarily in your biceps after bent-over rows, you're shortchanging your back of the stimulus it needs to grow. From the arms-extended position at the start of the row, pull the barbell in to your upper abdominal region. Don't even think about flexing your biceps; think instead about pulling through your elbows. The objective is scapular retraction, shoulder extension, and elbow flexion; do this by focusing your attention on your mid- and upper-back musculature, not on your biceps. 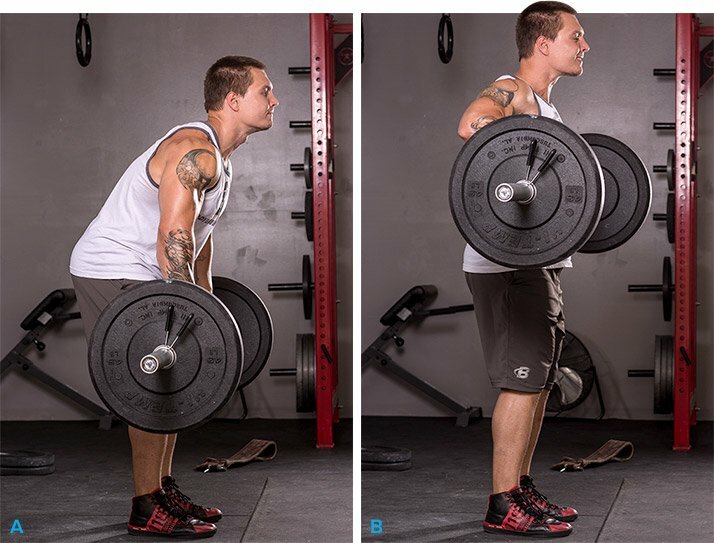 Deadlifts and cleans are both great movements, but don't make the mistake of turning the bent-over row into a quasi-version of either. You do that by simultaneously rowing and rising up from your hips, which is sometimes done when you use a weight that's too heavy. That action actively engages the lower-back musculature, which to this point had been only isometrically contracting to hold your spine in place. Besides shortening the range of motion, you're handling extremely heavy weights in an awkward position. From the standpoint of tracking your workouts, how is it even possible to quantitatively track your gains if every time you row there's a different degree of torso involvement? It's not, so it would be impossible to realistically track progress. Admittedly, some very muscular and strong men have squeezed out some extra reps via cheating, but that was probably to finish off a set, not to start one. The biggest reason for excessive torso involvement is ego—the drive to lift more weight. Lifting the torso makes the movement easier, but the path of least resistance yields the least results. Keep your torso locked in position to maximize benefits.